As the BYOD conversation begins to dwindle, the discussion will turn to the next wave in mobile trends: COPE (corporate owned, personally enabled). COPE gives both employers and employees the freedom of BYOD, while also offering a slew of benefits to each party. The corporate owned (CO) portion of the COPE policy helps companies keep their networks and information secure, which has become one of the biggest backlashes of the traditional BYOD program in the workplace. CO means that the company still owns the line of service and selects its preferred device and usage cost thresholds for employees to consider. This kind of ownership grants the company the right to wipe or disconnect devices on the corporate network, and ultimately offers pre-established security, just like the pre-BYOD days. While 77% of BYOD employees dislike the use of MDM on their device, the personally enabled (PE) aspect of COPE allows employees to choose the company-approved device they prefer from a predetermined list, while also enabling them to use it both personally and professionally like with BYOD. If an employee wants an iPhone, then the company only pays a predetermined amount (e.g. “cost threshold”). Employees then pay the remaining amount as outlined in the policy. This can also be implemented in a way that the company doesn’t offer any preferred device, but instead sets only a cost threshold for all users, no matter the device. Usage costs operate similarly to cost thresholds for devices. Companies choose a predetermined amount they will pay toward usage fees, such as voice minutes, texting, data, multimedia or international plans. Whatever the company does not cover in its cost threshold for usage is the responsibility of the employee. By setting these limits, the company is able to control the outcome of each monthly bill without limiting an employee to a single device or plan. Transitioning to this kind of program might seem like a headache, but MDM outsourcing helps IT departments seamlessly roll out COPE and maintain its features. In addition to working directly on this kind of program, MDM companies, can assist in adding more advanced features, troubleshooting, optimizing bills and handling administration. Employee and employer benefits are plentiful. COPE doesn’t just offer the feel of a BYOD policy; it truly gives employees the opportunity to customize both their device selection and data plan with the help of their company’s IT budget. These kinds of plans typically come with discounted offers, but it doesn’t stop there. Employees will also have the support system and help they need from their IT departments and MDM representatives, if companies choose to contract one. Employers reap benefits all the same. Costs can be controlled and cut by pooling minutes, lowering costs per device, having manageable budgets and offering continual optimization. In some cases, giving employees the ability to customize their plans can ultimately result in productivity outside the office. With COPE, the employer also has control over things like carrier, device preference and MDM capabilities. It does not matter what device the user is using, the key issue will be about how the user is able to connect to enterprise systems securely on mobile devices; and whether the enterprise system itself is optimized for mobile use. If an enterprise has deployed Microsoft SharePoint, then Azurati’s SharePoint2Go® solution will provide secure access to mobile optimized SharePoint on any mobile device and without requiring MDM investments. If employees are looking to access other core enterprise systems that are not optimized for mobile use, then Azurati ASAP® will shorten the development time to deliver secure cross-platform mobile enterprise applications. visit www.azurati.com for more information. Gartner talks about Bring-your-own-device (BYOD) as being the ‘the most radical shift in client computing since the introduction of the PC’, which if they are right, will fundamentally affect almost every organization and how they provision IT services to employees. Providing secure access to enterprise systems as part of an enterprise mobility or BYOD strategy may become a significant challenge to overcome for many organizations. Rory Staunton at industry analysts Strategy Partners, declared during a keynote speech recently, that ‘every enterprise system, from CRM and ERP applications, through to intranets and custom line-of-business applications will be targets for mobile conversion’. When you look at the most likely candidates for mobilization across the business, you would probably want to select those applications that reach and impact the most number of users and where the greatest return on mobile productivity would be. Microsoft SharePoint would seem to be amongst the most obvious of candidates, since 69% of the 65,000 organizations who have deployed SharePoint, have deployed it enterprise-wide, according to Microsoft, and it typically is the place that employees go to collaborate with each other, access documents and content and to keep informed of company news and events. So, what is stopping you from taking the plunge and providing access to SharePoint to your mobile users today? Firstly, there may be the realization that employees who try to access corporate systems on mobile devices, are essentially the same as external users, as far as information security is concerned, and if you do not currently allow external access over your firewall to your internal systems, then this will probably be one of the key areas for you to start your enterprise mobility and BYOD initiatives. Secondly, for those who have examined the standard mobile templates that ship with SharePoint, you will come to understand that unless you undertake a significant amount of custom development work (which will need to be repeated for each mobile device), it is unlikely that your business users are going to find the standard mobile SharePoint templates an engaging and productive working experience. There are a number of off-the-shelf mobile SharePoint solutions, like Azurati’s SharePoint2Go solution and others, and this will undoubtedly encourage you to start thinking about what kind of mobile experience you want to provide to your users. On this issue, it is important to be clear about where you (the employer, rather than the employee) stand on the provision of mobile services that access enterprise systems. It is one thing to allow personal devices, or corporately sanctioned devices to be used in the workplace, but this should not come at a cost to information security and control over user access and management. This may dictate whether you decide to deploy Native Mobile Applications (that can be purchased by individual users from App Stores and market places) and Mobile Web Applications that can be purchased and deployed centrally and can be updated without having to rely on end users to do this manually from their mobile platform App Stores. To many the perception is that Mobile Web Applications are not able to take advantage of value-adding mobile device functions or that they are not available in offline mode. On this front, a new generation of Mobile Web Applications, of which SharePoint2Go is a good example, are showing that you can deploy lightweight web-based mobile solutions that behave like native applications and can be used in offline mode. Azurati will be hosting a webinar on this topic on the 19th of September if you are interested in finding out more about what you should be looking out for before you consider trying to deploy SharePoint as part of your enterprise mobility or BYOD strategy. Does your SharePoint implementation support mobile users? Perhaps a good place to start answering this question may be to ask whether your SharePoint implementation supports and adds value to your staff in general? Custom views and WebParts (like Social Collaboration apps, corporate announcements, staff contact lists, BI reports and dashboards, CRM pipeline reports, etc). If your SharePoint environment provides some or all of these functions, then you probably feel that SharePoint is going a good job in supporting your users. Your staff who work away from the office or who want to access SharePoint on mobile devices however, may well feel quite differently, since it is unlikely that they are going to be able to have access to the same rich supporting environment on their smartphone or tablet. 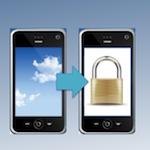 There are many issues to overcome in order to provide secure mobile access to SharePoint. Firstly, the standard mobile templates that ship with SharePoint are basic, uninspiring and difficult to customize and any development work that is taken place will need to be repeated for each mobile platform and form factor. Then you have the issue of security and authentication. Remembering that staff members who want to access corporate systems from their mobile devices, are essentially the same as external users; so firewalls, authentication procedures and mobile information security policies may need to be revised. Whether you take the plunge and undertake custom development of SharePoint’s native mobile templates, or whether you purchase an off-the-shelf mobile SharePoint application from an App store, you will still only have access to standard out-of-the-box SharePoint functions. If your SharePoint system has been branded and customized with WebParts and other functionality that add value to your staff to boost collaboration and productivtiy, then unfortunately all of the current mobile SharePoint solutions on the market fail to provide mobile users with a corresponding mobile SharePoint experience as they all only provide assess to standard functionality, like tasks, calendars, lists items and document libraries. That is, with the exception of Azurati. Azurati’s SharePoint2Go solution provides a highly secure cross-platform mobile SharePoint experience that will work on any device from a Windows 8 Surface tablet, to IOS device and everything in between. The big difference being that it also allows the mobile SharePoint UI to be branded and customized, so that it essentially becomes a mobile extension to the internal SharePoint environment and most importantly, it also allows custom developed WebParts, that provide the added value to SharePoint users, to be transformed into v-Parts® and made available to mobile users via SharePoint2Go. So, from an end user’s perspective, SharePoint2Go provides a rich mobile SharePoint experience that will allow mobile users to maintain office-level productivity when working on any smartphone or tablet. From the IT department’s perspective, SharePoint2Go allows mobile SharePoint to be deployed as part of a multi-platform or BYOD mobile strategy, but allowing the Business to maintain control over security and authentication. Why should you care about mobile users? Well, because many organizations see enterprise mobility as being one of their top strategic priorities. As new smartphones and tablets appear on the market and overtake the sales of laptops and desktops, the traditional definition of a mobile user will change. In the very near future, we will all be mobile users, and for 65% of organisations who responded to a recent survey by Gartner, we will increasingly expect to be able to bring our own devices in to the workplace and to connect to enterprise systems. If you are interested in providing secure access to mobile SharePoint as part of your enterprise mobility strategy, talk to Azurati or join other like-minded business and IT professionals by subscribing to the LinkedIn Group: Mobile SharePoint. Azurati also offers a range of expert consulting services to help you if you have not yet fully defined an enterprise mobility or BYOD strategy for your business. Would you like your SharePoint to go? As the world becomes increasingly mobile and smart-phones and tablets are used to access enterprise systems, it is only natural that the new breed of travelling executives, sales and marketing professionals or field-based staff are going to expect access to corporate information systems that help them to remain productive, like Microsoft SharePoint, to be made accessible on their mobile device of choice. How do you provide secure access to enterprise systems for mobile users (particularly when they are accessing on-premise systems like SharePoint across the corporate firewall)? Are your enterprise systems mobile-ready and engaging for your mobile users? Do you have a bring your own device (BYOD) or multi-platform corporate device policy? Does your mobility solutions vendor support your policies on security, multi-device/platform, user experience, etc.? How do you incorporate custom developed web parts and applications developed in standard SharePoint for mobile users? One would naturally think that the standard mobile views provided with Microsoft SharePoint should suffice – but unfortunately (for you) they rarely do. SharePoint’s standard mobile interface is designed for the lowest common denominator interface, resulting in a poor user experience that does not support finger navigation and productive mobile working, without significant manual development and customisation work – that will need to be done for each target mobile platform and device form-factor. This does not of course, address the issue of providing secure access for mobile users who want to access their SharePoint environment outside the corporate firewall, which is not supported without having to licence additional firewall security products and systems. Which of the following mobile SharePoint user interfaces would your mobile users find more engaging? Solutions like Azurati’s SharePoint2Go, allow enterprise users to access Microsoft SharePoint securely on any smartphone or tablet device; while ensuring that mobile users can remain productive when they are on the road. SharePoint2Go is a cloud-based enterprise mobility solution that provides multiple authentication options to allow corporate users to securely access any version of SharePoint on any mobile device, making it BYOD-compliant as standard. Mobile security has been designed in to the DNA of SharePoint2Go with security features like smartcard/2-factor authentication, through to a zero footprint policy (meaning that no residual data or content is left on the device) and 256-bit encrypted access. So, if your user’s are looking for SharePoint to go, make sure they use Azurati’s SharePoint2Go. 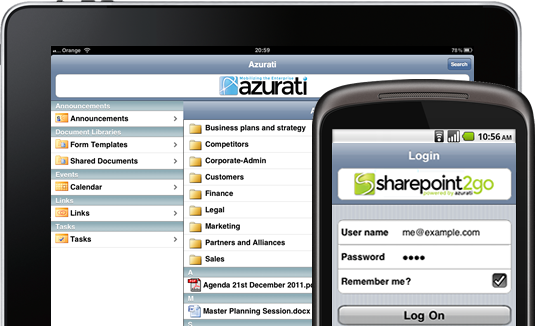 To find out more about SharePoint2Go and to request a demonstration or live trial, visit www.azurati.com. If you are interested in joining other like-minded business and IT professionals who are interested in mobile working with Microsoft SharePoint, why not also join our LinkedIn Group, Mobile SharePoint. Earlier this week, Azurati launched SharePoint2Go, a new cross-platform mobile SharePoint solution that allows mobile enterprise users to access Microsoft SharePoint securely on any smartphone or tablet. Business users increasingly have an expectation that they will be able to bring devices that they purchase and use in their private lives in to the workplace and expect to be able to connect with enterprise applications, like corporate email, CRM and their SharePoint environment. Whether your business has a Bring your own Device policy or a multiple mobile platform and device policy, SharePoint2Go is ready to provide access to your corporate SharePoint environment on any mobile device (and Apple Mac computers). Concern over mobile security is the number one concern cited by CIOs and the main factor that is preventing the deployment of mobile applications for enterprise use. That is why Azurati has made mobile security a cornerstone of its enterprise mobile proposition. SharePoint2Go offers multiple authentication options (from 2-factor and SAML tokens, to forms and basic authentication). Additionally, the SharePoint2Go mobile environment is protected by 256-bit encryption and a zero footprint policy, meaning that no residual content or data is left on the mobile device, so that information security cannot be compromised if the device is misplaced or stolen. SharePoint2Go automatically renders the user interface design so that it is optimized for the smartphone or tablet being used, making sure that the mobile SharePoint user experience is consistent across different platforms and form factors. SharePoint2Go enterprise edition customers are able to brand and customize the SharePoint2Go interface – a small feature that can have a big impact on brand communications, particularly for customer-facing staff. SharePoint2Go is unique in that it allows custom developed SharePoint WebParts to be converted in to mobile viewable V-Parts™ so that they can be accessed by mobile users via SharePoint2Go on any smartphone or tablet. Managing hundreds, thousands or even tens of thousands of users with SharePoint2Go is painless through the solution’s central user management and administration console. Mobile user administrators can manage and administer user accounts from their mobile device or from a standard desktop browser. Deploying SharePoint2Go can also be conducted easily by central admistrators. 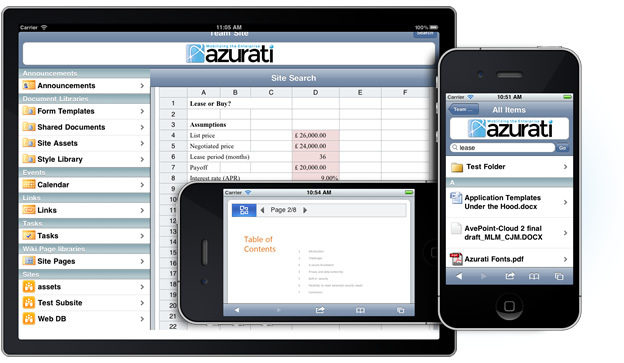 Visit www.azurati.com for more information and to request a free 30 day trial of SharePoint2Go. Azurati is delighted to have Mark Morrell, a leading independent expert on Intranet design and governance to share his thoughts on providing Intranet access to mobile users and why Microsoft SharePoint 2010 is the ideal corporate intranet platform. Why is SharePoint 2010 so widely used? I believe it is because it offers for the first time one technical solution that meets many business needs rather than just one. If you want to improve knowledge sharing you will have many tools to consider. Again if you need to manage your documents you will have a wide choice of vendors. But if your business has more than one need or can see how solving one will create other requirements then a solution like SharePoint 2010 comes become more attractive to consider. But what if your organisation needs employees to use your intranet while away from their place of work? There are huge savings in office costs and increases in productivity if employees can use the intranet to help them with their work while they are mobile. Before we can consider if SharePoint 2010 can help meet these needs and provide these benefits there are other important steps to take first. Why is your organisation considering mobile access to your intranet? You need to develop a strategy aligned to your overall business strategy that sets out how providing this need will help to improve the performance. Without a clear, agreed, mobile strategy in place there is little chance of creating a successful business case for a solution that can help employees. You need to research which content and tools are most needed while employees are mobile. Who should be responsible for sponsoring the implementation of your mobile strategy? You need to find a senior representative who will champion this or, better still, a board or steering group of senior representatives from business functions across your organisation. Make sure the role is clear, and you have the authority to make the decisions needed, supported by funding. Who needs to use a mobile device for their work? You need to be clear which employees will benefit from having a mobile device. It probably will not be everyone. Even if it is, you will have to prioritise who has the greatest need. Factors like the number of employees involved, time spent away from their place of work, what contribution they can make, will help decide the greatest need. As well as having a champion for the use of mobile devices your governance framework needs to include the standards for owners of content and tools to follow so mobile devices can be used by employees. Roles and responsibilities need to include meeting the needs of mobile users for content and tool owners. The content and tools must not be a complete duplication of what exists already. Will you let employees bring their own devices to work or will you provide your own? That decision is critical and will depend on your organisation’s corporate values, type of employees, security (more below on this), funding and speed of adoption. Once that decision is made you can then focus on what devices your organisation provides or you recommend employees have that offer the best experience for what they need to do while mobile. How can you be sure the right people only are using your intranet? It is vital you have a representative from your Legal team involved as well as from IT. You need to find the right balance of secure but easy access. It is no good if it takes ages to authenticate who you are before employee can access your intranet. But you do need some intelligent software working in the background to ensure you know who is accessing content with a mobile device. As I said at the beginning most organisations are either considering using SharePoint 2010 or are in various stages of rolling out to meet their needs. One of these is increasingly the need to provide content and tools that is needed by employees while mobile. The problem with SharePoint 2010 is the ‘out of the box’ experience can be a bit underwhelming. It is a text only version which most mobile users of internet sites will feel is like going back in time. It may be improved by the next release of SharePoint but can your organisation afford to wait that long? 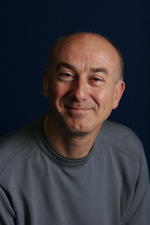 Mark Morrell is an intranet pioneer combining strategic thinking with implementation skills. Since 1996, he has developed intranet strategies with first-hand practical experience of implementing major technology and change projects. As the former BT Intranet Manager, he helped to transform BT’s intranet into one of the best global examples for governance, engagement and collaboration. Mark is an expert in SharePoint and can share his knowledge and experience of the digital workplace and other intranet topics. Mark has established his consultancy Mark Morrell Ltd to help major organisations with their intranet strategy, governance, standards and use of collaboration tools. Research and consulting firm, Frost and Sullivan, recently surveyed 204 C-level business and IT executives about Enterprise Mobility. The survey found that a majority of businesses are in favour of a bring your own device (BYOD) policy, with 61% supporting BYOD and the use of personal devices to access corporate systems and information. The study showed that within this group, 34% of businesses allow BYOD for all employees and offer full support for all devices, with another 27% allowing BYOD for specific departments. In the report, enterprise mobility ranks high in terms of priority compared to other IT investments. More than 25% of companies surveyed rated enteprise mobility projects as either their top priority or a very important priority for 2012. New mobile devices are emerging at such a pace that many companies have struggled to keep pace with the variety of platforms, devices and form factors; meaning that in many cases, personally owned smartphones and tablets are newer and better than devices issued by employers. “Allowing employees to use a device of their choice to work through supporting a BYOD strategy is advantageous for organisations with benefits such as increased productivity, greater employee retention (achieved through enhanced job satisfaction) and cost savings through lower capital and operating costs. However, security risks are a concern for many organisations in supporting BYOD”, says Audrey Williams of Frost & Sullivan. 56% of the businesses who responded to the Frost & Sullivan survey cited security concerns as being their number one concern with adopting a BYOD and enterprise mobility strategy; while 59% of businesses cite document and content management as being the most important tools to aide mobile productivity. This is clearly good news for emerging enterprise mobility solution providers, like Azurati, who will be releasing a new secure mobile SharePoint solution, called SharePoint2Go at the end of May that aims to give mobile staff office-level productivity when working on smartphones and tablets. Azurati has listened to the concerns of customers and leading independent experts, like Frost & Sullivan and other analyst organisations, and has built enterprise security features into the DNA of its enterprise mobility solutions, like two-factor authentication, single sign-on to multiple SharePoint sites, 256-bit encryption and a zero footprint policy, meaning that nothing is left on the device so that information security will not be compromised in the event that the mobile device is lost or misplaced. To understand more about how Azurati can help you achieve secure multi-device access to core enterprise systems, like Microsoft SharePoint, visit www.azurati.com.